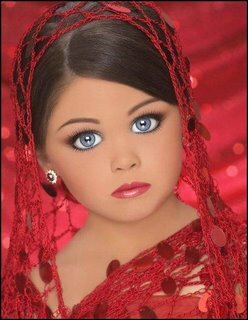 In trying to draw some kind of shaky line between children's beauty pageants and the current trend toward skank high school fiction, I came across this photo. It's for a "most beautiful face" contest for liddle un's. And it's creeping me the hell out. I mean come on, that can't be real can it?